You will need a couple key tools to help you get the full impact of the 4 Putting Elements training program. We have assembled your Tool Kit. It will give you the feedback to make your practice perfect. It includes 7 EyeLine aids, a carry bag, and the 4 Elements Practice Sessions Book. With a $260.00 value, this package saves you some money and some strokes! Carry Bag - Keep your tools ready! 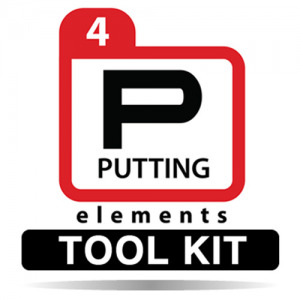 If you have any questions regarding the EyeLine Golf 4 Putting Elements Tool Kit, please give us a call, we would be happy to help you with any questions you may have. Write an online review on the EyeLine Golf 4 Putting Elements Tool Kit, and share your thoughts with others.